For over 20 years we have been installing and maintaining spectacular paver elements. Whether you are looking for a new paver patio, walkway, driveway, fireplace, planters, pillars, steps, pool decks, or a custom paver surround for an outdoor kitchen, Midwest Nursery can help you. When it comes to pavers there are a lot of different manufacturers and product lines to choose from. Our experience has shown us which products work best for specific applications. More expensive is not always better and we know which elements will stand the test of time. We will take the time to assist you in choosing the best materials for your job. Check out our Gallery to see examples of our paver projects. At Midwest Nursery we only use paver products that we know will stand up to our harsh Midwest climate. Unilock is an industry leader and was the first paving stone manufacturer in North America. Unilock is durable and has a wide variety of colors to choose from. Paveloc is a Unilock company, and has great design ideas on their site. Belgard also offers a very durable product that is versatile. 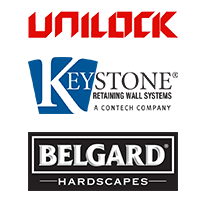 Northfield is a Belgard distributor, and their website also shows many great applications for their product. Keystone is an industry leader for retaining walls. Contact us today and we can discuss which products work best and are most economical for your landscaping project. Often times clients call us to fix a paver patio that has "waves" or seperating bricks. Sometimes we can fix the problem, but occasionally the pavers need to be completely removed to fix the base. When you are shopping for a paver element your contractor needs to specify the type of base preparation they will be installing. The type of aggregate base, depth, and compaction are just a few of the considerations before installing paver elements. Without this proper base even the best pavers will fail over time. We built our business by word of mouth and wouldn't be where we are today without quality craftsmanship and attention to detail that will keep your paver project looking great for years to come. Contact us today to discuss how we can help you with your paver project.